I haven’t been posting much lately because of work loads and things competing for my time. But I did just get a notice that the project, which I have been calling the “Super Triple Secret Project” has just been put out for public consumption at Threads Magazine. You can see it in the current issue of Threads, and it is online (without all the photos) here. The article started thanks to the striped dress, which I made for myself last year for a summer dress. The pattern is New Look 6557. I changed the waistband pattern, as well as the grain alignments on several of the pattern pieces. I love this dress, and in warm weather I wear it frequently. Of course, I’m sure they had to safety pin it to within an inch of it’s life to fit the model, but it looks pretty good, I think. 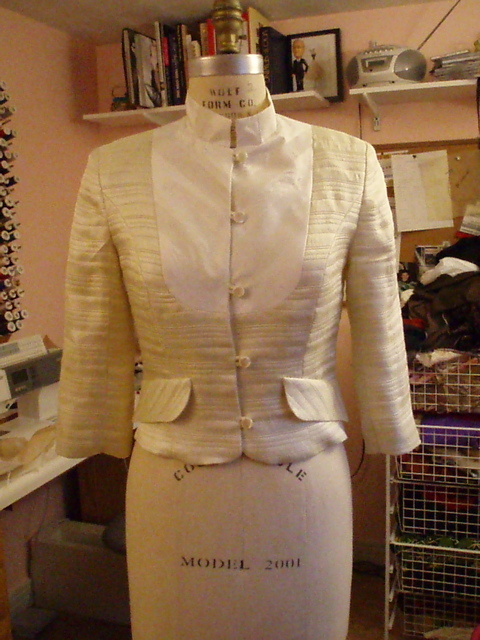 The “fun” part of the project, and the Super Triple Secret part that had me tearing my hair out, was the white jacket. Now, that is one gorgeous, gorgeous jacket! I based it on a D-Squared look from the spring 2006 RTW line. I used a McCalls pattern as the basis, and you can see the process I went through to convert the pattern on my blog. It’s made from two silk fabrics, a duppioni that has nubby 1 inch wide stripes woven into it, and a novelty silk ottoman-type, that was woven in such a way that it had a quilted effect. The fabric was double faced with uneven horizontal stripes woven through it. And there was silk batting between the layers. When I opened the package from Threads containing the fabrics, I gasped in surprise and pleasure, they were that lovely. Sewing with them? Hmmmmm, that was another issue. The duppioni was just fine. I love duppioni because it sews up well and is very easy to manipulate. The quilted silk, on the other hand, was an unmitigated rhymes-with-witch. I have two sewing machines in my sewing room. One is a Pfaff with differential feed, the other is an industrial Juki. 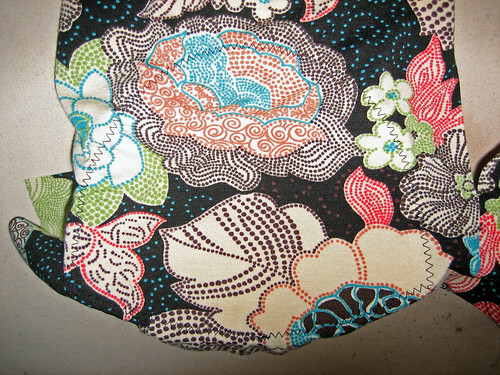 I decided right out of the gate that the Juki would not work with this fabric. So first I tried sewing a seam with the Pfaff. Because of the horizontal quilting, I was super, super careful cutting the fabric so the lines would match across the seams of this princess style pattern. When dealing with a fabric like this, always, always cut out your pattern pieces in a single-layer layout. I did so, and it gave me control over the placement of the design and grain lines. Under the presser foot, though, this fabric took on a Bad Diva personality. It loved to shift and move around, even with the differential feed turned on. I hand basted all the seams, and I even ended up recutting some pattern pieces to compensate for the shifting. Gah! It still didn’t want to cooperate! I did finally beat it into submission, but it cost me dearly in the number of gray hairs I got from it. 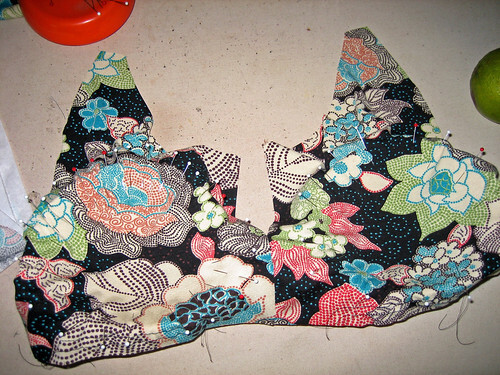 Yesterday, I began work on the Hot Patterns’ Cha Cha Cha halter dress. Rather than worrying about being able to find a comfortable halter bra (and having to fuss with that with each wearing) I decided to add bra cups instead. Since this is a casual garment, I opted to sew the cups into the lining. On a dressier garment, I think it would be nicer to attach the cups to an inner layer such as stretch illusion and hide the construction with a lining. First, I want to point out that I am working with a knit – a beautiful rayon/lycra from Fabric Mart. Were I working with a woven fabric, I would elect to attach the cups temporarily – probably using snaps – to make ironing easier. Step 1: Pin the garment together, substituting the lining sections *wrong side out* for the outer bodice sections. Try on, pinning the cups into position *on the outside*. This way you will be spared the step of transferring markings from the outer bodice sections to the lining sections. I basted the center front together to make this easier – you can just pin that if you prefer. 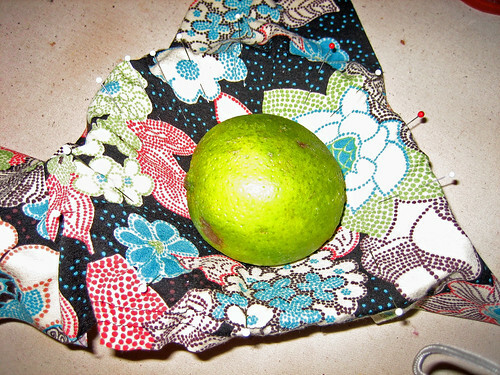 Step 2: After removing the garment, I used a little help (a lime!) to make pinning a little easier. You want to allow enough ease inside the cup for the bust. 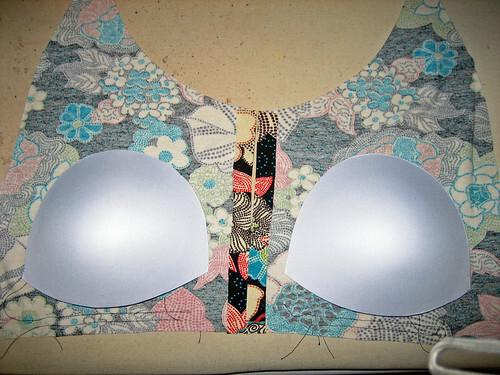 Step 3: Sewing from the fabric side, I felt my way around the edges of the bra cup. A trolley needle was very helpful for easing in the fullness where necessary. Step 4: The sewn cup from the inside and outside – it really is very easy to accurately sew around the cup even though you are only relying on feel to guide you. 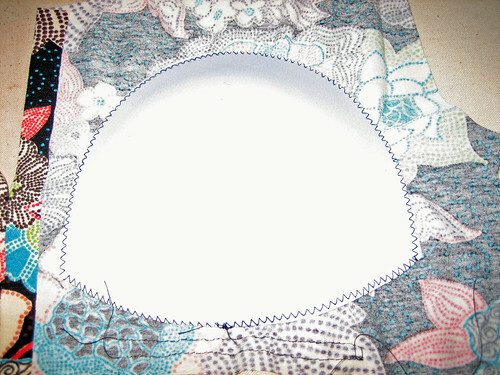 Once both cups have been sewn into the lining, I will remove the center front basting and baste the lining and outer pieces together and proceed as per the pattern instructions. An easy addition that will make a summer dress much more comfortable to wear! Vogue pattern 7703 view D was used to make this drawstring bag in butter soft blue leather. I used 2 pieces of soft leather, one hide was 5 foot and the other was 7 foot . Three different fusible interfacings to add some strength and add some body to the bag because the leather was too soft to become a bag on its own. On top the extra heavy woven, middle the non woven, at the bottom Hansel. These interfacings are special made to use with leather, because you can fuse the interfacing with the iron on a warm setting. The non-woven interfacing was fused on all the pattern parts except the drawstring as an underlay for the woven leather interfacing Hansel which is a bit rough and I did not want to change the hand of the leather. The extra heavy interfacing is added to the bottom part on top of the previous two interfacings, the leather facing parts and the shoulder strap. Dupioni silk fabric was used for the lining, front pocket lining and the interior pocket. I made some pattern and design changes. The backside of the bag is sewn with a center seam because I had not enough leather to cut that pattern without a seam. It was an easy alteration, just double half of the center backside pattern and add seam allowances. I topstitched the s.a. on both sides of the center back seam. The front pocket was too wide to my taste so I stitched a line at the center of the pocket, now there are 2 separate pockets. The pattern instructions suggest to use cardboard for the bottom part. I was not satisfied with the result it was too stiff so I used a remnant piece of upholstery leather which I glued to the bottom part. Also skipped one of the shoulder straps because I find it annoying that wearing a shoulder bag which has 2 long shoulder straps , one of the shoulder straps is always falling down . I used only one shoulder strap (the length of the pattern strap is 21,5 inch /55 cm while I used a 38,5 inch/ 98 cm length) which I sewed diagonal at the front and at the back side of the bag. The instructions for sewing the lining bag was different than what I did. I sewed the side seams of the lining but left one piece open for turning after I attached the lining at the leather facing and sewed the bottom part. The last step for sewing the lining part was to sew the left open part by hand. I noticed too late that the placement of the interior pocket was too high placed, so if you want to make this bag be aware of this. It will be more convenient if the posket is placed lower on the pattern an adding a snap would be handy too. I used a faux printed green leather to make this bag with some modifications. The pattern came with sewing instructions but I did not follow them because I made some alterations on the pattern so I used the common sense attitude. I used green faux printed leather, a woven interfacing to support the faux leather, 2 metal teeth zippers, rigilene boning, lining which I interfaced with a fusible stretch interfacing, double sided fusible craft tape, 2 silver metal D-rings with screws, a bag stop and a key ring all from my stash. I made some minor design changes. First I like my bags with a zipper closure so I redraw the opening for the bag in a more fluent shape so I could attach a zipper to close the bag, see the red lines for the new shape opening. I also did cut a longer shoulder strap. To attach the bottom side part I used 3/8 inch (1 cm) seam-allowance instead of the 5/8 inch (1,5cm). This will result in a bit wider/deeper bottom/side part as well as the bag itself. I wanted to keep the shape of the bag and prevent my bag to collapse , so I used rigilene boning . I glued the boning all away around the bag between the seam allowances of the bottom/side part start and finish about 5/8 inch ( 1,5cm) from the opening . Used a double sided fusible tape and fused this tape ( using a Teflon sheet to protect the faux leather) next to the bottom seams, glued the rigilene boning to the tape and top-stitched the seam allowance from the right side . 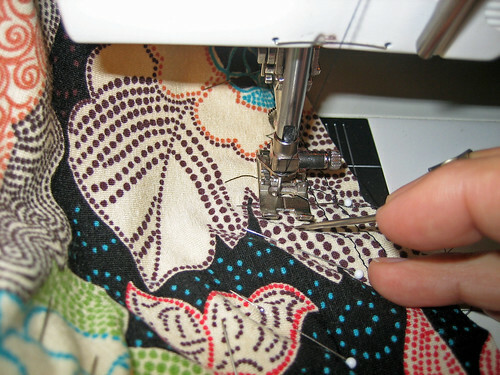 The first stitching line is close to the seam and the next stitching line a bit farther away. The zipper closure is made of 2 rectangle pieces of fabric and lining the same wide as the upper side opening. For the closure of the bag I sewed the lining (facing) at the zipper tape next to the teeth, fold the lining away and sewed the zipper at the fabric, pinned the lining bag at the bag opening and sewed the closure/opening part at the bag opening, pivoting at the corners on which I already basted the shoulder strap loops. Double sided fusible tape is also fused at the seam allowances of both the bag upper part and the part where the zipper was stitched, top-stitched those seams from the outside, fused the tape also at the zipper tape next to the lining and folding the lining over it and hand stitched the facing lining at the bag lining part. This way the top-stitching is only visible from the outside and invisible from the lining part. The fabric loops for the D-rings are made to measure. The faux leather fabric is interlined with a woven fusible interfacing , the lining with a stretch fusible interfacing and I did the zipper pocket my way, also placed the pocket lower than the pattern marks. The pattern for the cell phone pocket was too narrow for my cell phone so I adjusted that and skipped the other small pocket. Sewed the cell phone pocket at one side of the bottom side part and added a key ring to the other side which in this picture is not visible. For both the pockets I used the lining fabric double to add some strength . For the shoulder strap I did not want to add bulk by using seam allowances on the long sides so I did some testing to get the least bulk at the seams. I sewed the strap wrong sites together in half with a loose tension large zigzag stitch but only ½ of the zigzag stitch catches the fabric, pulled those two edges from each other and the result was a non bulk shoulder strap. I wove a piece of cotton twill tape through the shoulder strap with the help of a safety pin and top-stitched the strap along both edges. Which I glue on every shoulder strap of my bags rtw or self made,to prevent sliding from my shoulder.